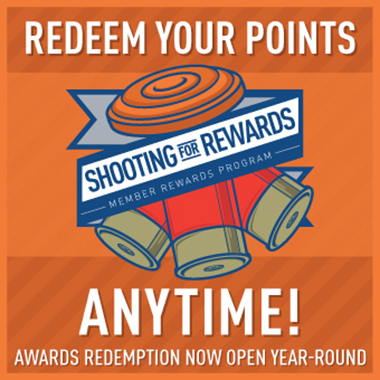 You may have heard of sporting clays referred to as “golf with a shotgun,” and that’s a fair comparison. Like golf courses, no two sporting clays courses are alike, and terrain and background have a lot to do with how targets are presented. Since no two courses are alike, shooters travel to different courses to experience variety. If there is a malfunction or the gun does not fire, continue pointing the gun safely downrange. Then unload ir or ask for assistance. The problem may be due to faulty ammo or a mechanical failure of the gun. If at any time a shot sounds light or different, stop immediately, unload, and check your barrel to make sure the wad has cleared and there are no obstructions. To shoot a round of sporting clays, you’ll start on the assigned first station and shoot each station in order. Before the first person in every squad shoots, the referee will show your squad the targets so you’ll be familiar with what and how the targets are being thrown and strategize how you’ll shoot them. When you shoot, the target will be considered a “dead bird” if any part of it is broken. The referee will score each shot a hit or miss and has the final word. When you’re done shooting at a station, open your gun, remove the used hulls, and exit the station. Remain behind the station, out of the way of the scorer, until all shooters have shot that station and are ready to move on. When waiting your turn, it’s acceptable to talk in a low voice so as not to disturb shooters, scorers, and others.